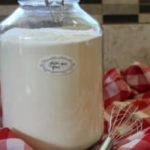 Erika’s All Purpose Gluten Free Flour Mix Recipe – The BEST Gluten Free Flour Mix that whips up in less than 5 minutes! Use Cup for Cup in many of your favorite recipes. 1 Bag (20 oz or 4.5 Cups) Tapioca Flour (aka Tapioca Starch) **NOTE: If using Bob’s Red Mill Tapioca Flour – Bob’s recently changed their Tapioca Flour packaging to smaller 15 ounce bags – Since you will still need 20 oz (4.5 Cups) per batch. You will need to add an additional 1 1/2 cups from a second bag. Pour all of the ingredients into an extra large bowl and mix until well incorporated – this will take about 3-5 minutes with a whisk. Do not skimp on the mixing… otherwise, the ingredients will not be blended appropriately and will not achieve the same results. Store flour in an airtight container. My favorite storage jars are these 5L Glass Jars with Snap Lids – they fit a batch of this flour perfectly! I use this combination of flours because it seems to be the least irritating to even the most sensitive stomachs & allergies. I use Bob’s Red Mill for all the ingredients. Of course, you can always grind your own flours in the VitaMix, but it can be very difficult to duplicate the smooth texture of stone ground. If you are sensitive to the Tapioca Flour/Starch, you can replace it with Potato Starch (NOT Potato flour).